In 1993 she was invited to take part in the DAAD scholarship in Berlin. She produced a three-part project at the end of her residency that encapsulated a practice that dealt with the translation of space, changing context, or the rendering of a new perspective. In one gallery she simply lowered the fluorescent ceiling lights; in a second she hooked up television monitors that screened the view from her own studio window; and finally, in a section of Berlin predominantly inhabited by Turkish immigrants, she covered a building’s façade with very particular Turkish verb endings that convey not only the past tense, but the past as witnessed by a third party. Other projects followed that were somehow similar in thought structure but entirely different in realization. In 1996 she placed metal detectors at the entrance of Frankfurt’s Portikus, accentuating the threshold between real life and art, leaving the viewer aware of his entrance, presence, and the surrounding physical space. The themes of control of access and freedom of movement were again addressed a year later in her piece for the Münster Sculpture Project when Erkmen was denied access to the main cathedral, her preferred site. She overcame this hiccup by flying fifteenth and sixteenth century sculptures by helicopter from the roof of the museum to a platform opposite the cathedral’s west façade; the airspace above the site was not under the Provost’s control. For Shipped Ships in 2002, she moved passenger ferries from Istanbul, Venice, and Shingu on larger transport vessels to Frankfurt, where they were then used — manned by their original crews from their countries of origin — to transport city workers and tourists across the river Main, giving them all an entirely new view of the city. Again using a river as venue, this time in Bremen at the GAK institution, which sits on the edge of the Weser, Erkmen floated buoys, their number corresponding to the number of the building’s riverfront windows. Through the windows, each buoy was attached with a rope to a ball, which would reflect any changes on the river, waves from passing boats, the lowering tide. Appropriately, this piece was entitled Übersetzung (Translation). Now at the Schirn Kunsthalle in the city of Frankfurt — where Erkmen is a professor at the Städel Art Academy — the artist has again translated a common, everyday site by both accentuating its historical association and endowing it with new meaning. The Schirn is a colossal postmodern building built in the eighties, all marble, concrete and plate glass. One of its main features is the Rotunda, a sort of circular outdoor atrium topped by a glass dome and ringed by concrete pillars through which various paths lead to different places. The site functions as an area of ingression (framing the Kunsthalle’s main entrance), an area of transition for the public (at the top of a flight of stairs that connects through to Frankfurt’s main old square), and an area of congregation for visitors both to the institution itself (especially during the chic opening night cocktails) and to the glamorous Schirn Café directly opposite. 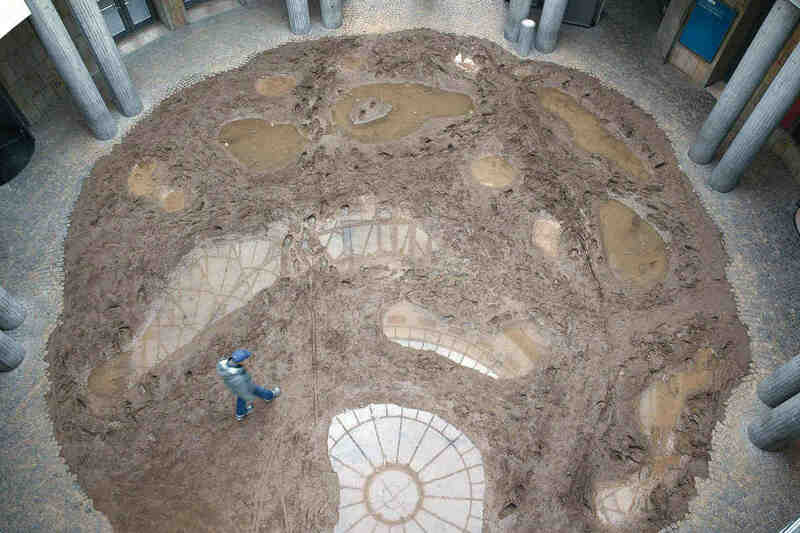 The Rotunda’s floor is usually paved with concentric circles of neatly laid cobblestones. But for Erkmen’s project, entitled durchnässt (soaked), the cobblestones have been unearthed and replaced with earth, heaping great bucketfuls of dirt, mixed with water to create a sloppy, muddy passage. Irregularly placed islands of dirt seem to float among the filthy puddles and offer themselves up as stepping stones through this dismal wasteland. Where once people could confidently stride through, now they must tread carefully, walking around or picking their way through, and are thus forced to notice and pay more attention an area that might otherwise have been overlooked. The contrast between the Schirn’s clean, pure facade and this swamp is striking, as though a farm yard were transported into the center of this gleaming metropolis, home of the European Central Bank and high finance. It is somehow uncomfortable, perhaps like mud-soaked boots on a society hostess’ white sofa. Yet the piece is not only about contrast. 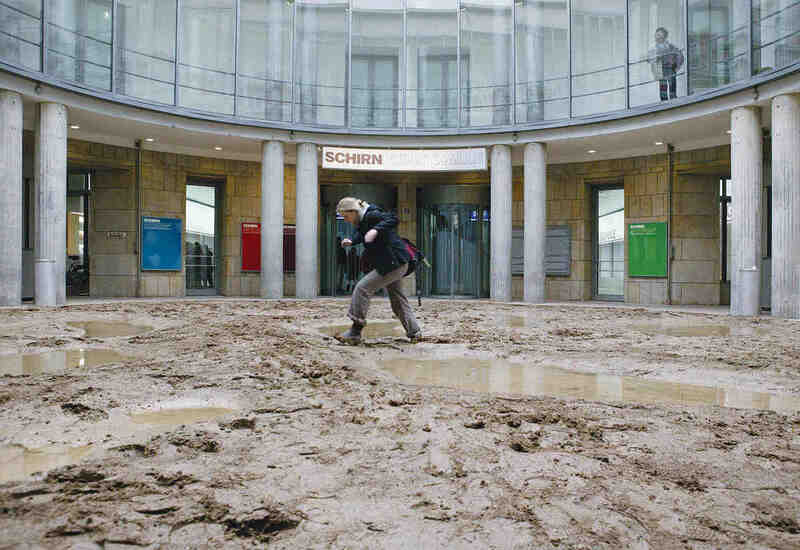 The Kunsthalle’s name comes from the archaic German word “Schirn,” which referred to an open-air stall for selling goods; surely at the medieval markets the ground looked similar — perhaps not with the cigarette butts now ground into the mud, but certainly other detritus of trade and passage? Into the late nineteenth century the butchers’ stalls were still located on this strip of land, which was completely destroyed along with the rest of the old town during the Second World War and remained unreconstructed for the next thirty-seven years. Again, while the city was in ruins, the population likely had a muddy walkway not dissimilar to what is now presented by this artist, whose particular form of archeology does not unearth other structures but only the earth itself and the stories buried within it.